If you’ve always wanted to work from home and you are good at catching spelling and grammar errors in writing, working as an online proofreader may just be the thing for you! 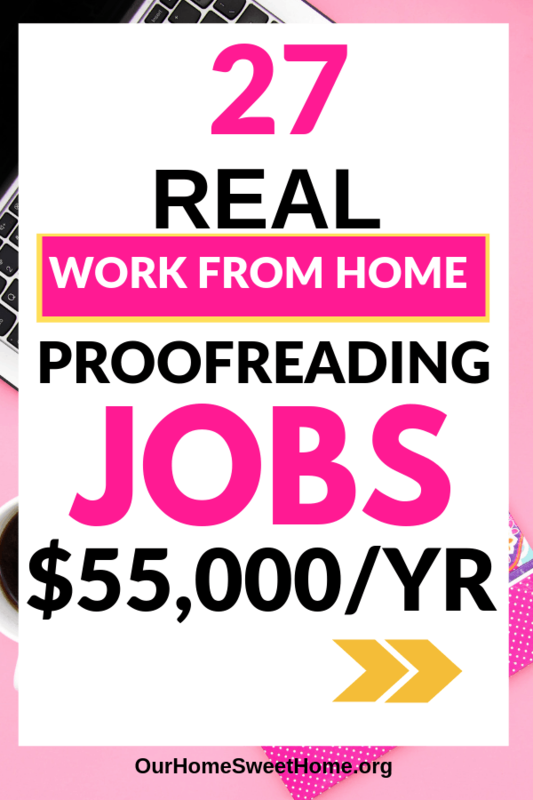 There are plenty of proofreading jobs from home and you can make some decent money each year. Many publishers online hire proofreaders to make sure their articles and books look just right for publishing. This is why there is such a high demand for proofreaders. You really can make money as a proofreader from home and the hours are flexible. I’ve compiled a list of companies where you can find proofreading jobs from home – even for beginners. Some of these jobs do work with beginners but others require some sort of training, experience or a college degree. You can apply for some jobs as a beginner and then work your way to some of the other jobs after some training and experience. Before we dive in, let’s go over a few noteworthy details about proofreading. Proofreading is the process of examining text to find and correct any grammatical errors and spelling errors. It’s done right before publishing. Proofreading is an excellent work from home job because it can be done using just a laptop or tablet. It’s also easy to share files online. All you really need is a computer or tablet and an internet connection. Do I Need Training or Qualifications? Yes, you do need some training. Proofreading jobs from home does require some form of preparation or qualification before getting started. The good thing is that you can get some training at no cost to you! It’s easy to get started. Caitlin Pyle is awesome. She put together a FREE proofreading workshop that teaches you how to make money from home proofreading as a freelancer. In this workshop, Caitlin will show you what to expect as a proofreader and she helps you decide if proofreading is something that’s right for you. Click here to get instant access to her FREE proofreading workshop today! How much you get paid will vary according to the project or client. You get paid either per project, per hour, or per page. The most common is ‘per page’ according to how many words are on each page. You can make good money doing online proofreading jobs from home. According to Salary.com the average Proofreader salary in the United States is $50,846 as of February 28, 2019, but the range can fall between $44,618 and $58,064. The ranges in salary depends on many factors, including the years of experience, education, including certifications and any other additional qualifications. What Tools Do I Need As a Proofreader? As already mentioned, all you really need is a computer or tablet and an internet connection. Google Docs – many proofreading jobs from home are done using Google Docs which allows for an easy way to mark and add comments to the original document. Google Docs is also easy to share online back and forth. Grammarly is a fantastic online tool for finding grammar and spelling errors. The free version can be used to spot text errors on social media platforms and on WordPress, but you will require a Premium account for Google Docs. It can be really beneficial as a time-saver! It can also make suggestions for sentence structure and style. Keep in mind that it cannot catch everything so don’t depend on it entirely. McGraw-Hill’s Proofreading Handbook in my opinion, is a must-have resource for anyone looking to proofread at home or anywhere. There are proofreading checklists, a list of commonly misspelled words, a chart of proofreading symbols, and so much more to help you become an excellent proofreader. The Chicago Manual of Style is a popular book that clients refer to when communicating with proofreaders about their work so it’s a highly recommended resource to have with you. What Skills Do I Need To Become a Proofreader? It is important to have excellent English skills so you could easily catch errors in a document such as any spelling or grammar errors. You will also need to know how to use standard proofreading marks. Some sites may want you to have a degree in either Journalism or English; others want you to just have some experience, and others will allow you to do proofreading jobs from home without experience. It will be beneficial if you are someone who loves to read. Since you will be reading a lot for this type of job, it’s a good idea to get into the habit of reading. The free proofreading workshop goes into details about which skills are needed to become a proofreader. Proofreading vs Editing – Is There a Difference? Yes, there is a difference between proofreading and editing although they are oftentimes used to mean the same thing when they are not the same. Proofreading is the final stage of the editing process to check for missing commas, spelling error and other grammatical errors. Whereas, editing a piece of writing could be removing and adding complete sentences to improve the writing flow. To get started working with this company, all proofreaders must pass a 20-minute screening test. The hours of work are quite flexible and they pay more than the U.S average hourly wage as a proofreader. Check out Proofreadingservices.com. Fiverr is a good place to get freelancing work of various types and that includes proofreading jobs. You sell your services as what they call, a ‘gig’ and although the most basic pay for a gig is $5, you can add more services to your gigs and charge more money. Click here to get started on Fiverr and earn as a proofreader! Cactus Communications usually want proofreaders and editors with a medical background. The work hours are flexible for proofreading jobs at home. This company hires editors that have a basic graduate degree or a PhD. Applicants who don’t have a degree should have some experience in professional editing and be an expert on a particular subject. Click here to learn more about Cactus Communications! Proofread Now hires proofreaders to look over business documents for their clients from time to time. Applicants must have a minimum of five years experience and pass various tests by the company. At the time of writing this post, there are no positions available but check back later to see when they are looking for proofreaders again. You could also sign up on the page to be notified of any job openings. ProofreadingPal hires proofreaders on a regular basis and offers good pay. When you apply, you have to fill out a short independent contractor questionnaire and then wait to hear back from the company within 5 to 10 business days. Scribendi provides opportunities for proofreading jobs from home and also on-site. Full time workers are given preference. You are required to have a relevant university degree and minimum of three years experience. They provide training for the job online and you get paid through Paypal in US dollars. Sibia Proofreading is currently not hiring proofreaders (at the time of writing this post) but they usually have proofreading jobs from home as needed.Proofreaders will be proofreading medical journals, reports, projects that are either scientific or academic. Therefore, applicants are required to have some expert knowledge in the field. WordsRU offers proofreading and editing services to various clients. You must have a relevant degree and 2 years experience as a proofreader. Your education background should include a Masters or PhD. Polished Paper is an editing and proofreading service that hires editors to provide services to their clients. To apply, submit a resume and the information requested on their site. There is also an editing test that you must pass. Gramlee is always looking for editors. They have work around the clock but you will need to return work rather quickly with this company. On their website they promise clients to have documents of 3000 words returned and proofread within twenty-four hours. 11. EditFast has positions available for proofreaders, editors, and writers. Although the company provides a free service to freelance editors,they do take 40% of the total project price after the completion of the project. You must go through an editing test before doing any projects. If you get positive feedback on your test, you will be provided with a web page and a profile will be created so that you can to get any new notifications of projects. All payments are made through PayPal on the last day of the month. 12. Guru is a website that offers freelance jobs with a special category for editing and proofreading openings. Clients post their projects on the site while those providing a service can respond to potential clients for the job. You need to sign up on the free site to browse available jobs. 13. Wordy provides both proofreading and editing services to its clients so they often need services that an editor or proofreader can provide.They usually do advertise online proofreading jobs from home. the time of this writing, the site is being updated so they are not making sign-ups available for editors for the time being. Check back in the future to see when they open up again. 14. Edit 911 hires proofreaders that have skills in published writing and candidates require a PhD in a related field. Those benefiting from their services include: businesses, authors, and students. 15. English Trackers hires academic editors through their site. They require applicants to be a Native English speaker and have 2 years experience in academic editing. The work hours are flexible and payments are made on the 15th of every month through Pay Pal. 16. Leaf Group offers job opportunities in copy editing as an independent contractor. Applicants are required to have a minimum of two years experience and be familiar with the AP writing style. 17. Domainite hires editors on a regular basis and will hire even if you don’t have a graduate degree or previous experience. requires that they take an editing test and pass. However, they do expect applicants to undergo and pass an editing test before hiring. 18. Scribbr is an editing company based in the Netherlands but you don’t have to live there to become a proofreader. Potential proofreaders and editors must be fluent in English, pass a language quiz, and go through their editor training. Candidates must have also completed a bachelor’s degree or higher and be available to work at least 10 hours a week. The work usually involves editing dissertations, editing essays, and finding any plagiarism. 19. Wordfirm Inc. hires proofreaders and copy editors. To qualify to work with them, you must fill out an independent contractor application that is quite lengthy but it does help the company figure out what job is best for you. Aside from that, preference is given to those with a degree and they do prefer to hire a proofreader with about five years experience. 20. Wordvice is an international English editing company. They offer proofreading jobs from home to those with at least two years experience and to those either enrolled in or have completed a graduate degree program. The work consists of editing and proofreading academic papers, admissions essays, and other documents for grammar and mechanics errors. 21. Kibin also hires from time to time, although right now there aren’t any positions available as a proofreader. Go back to their site sometime later to check if any positions are open. 22. Editor World is looking for independent contractors (at the time of writing this post) for proofreading jobs from home. You must be a Native English speaker, have a degree, and have some editing experience. They is also a short editing test that you must pass before any jobs will be assigned. 23. Scribe Writing is a publishing company that occasionally looks for freelance proofreaders. You will have to keep checking the site to see if any positions are available. Editors that work with this company get to collaborate with writers and authors quite freely to be ensure their best work is produced. 24. IXL Learning hire curriculum editors occasionally to make changes to their program of study since the company offers technology based education services. Those hired will have to have some experience in the subject matter of the curriculum. 25. PeoplePerHour – PeoplePerHour is a site where potential proofreaders sign up and set up a profile. matches freelances editors and proofreaders with individuals or companies that need their services. To get hired as a freelance proofreader, companies or individuals needing the services of a proofreader connects with proofreaders on the site. 26. Kirkus Media offers book authors the services of a qualified editor to review and edit their work. They will offer freelance editor jobs. You need to pass their sample test and have some previous experience to get the job. 27. Upwork is an online platform that connects freelancers and clients to complete freelancing assignments. As a freelancer you can setup your profile on the site to let potential clients know of your services and make connections through the platform to look for and accept proofreading assignments. Here is a video from the Youtube channel, r3ciprocity Team, offering some good tips on starting a freelance proofreading business. There are some really helpful points to consider when trying to proofread professionally as an independent contractor. Proofreading is the process of examining text to find and correct any grammatical errors and spelling errors. Sign up for the FREE proofreading workshop and find out if becoming a proofreader from home is right for you. You can make up to $36,000/year as a freelance proofreader. To make your proofreading life easier, these resources are recommended to have on hand: Google Docs, Grammarly, the ,McGraw-Hill’s Proofreading Handbook, and The Chicago Manual of Style. Many jobs (but not all) require that applicants hold a degree and have some proofreading experience. There is a difference between a proofreader and an editor. Browse the list of companies above for potential proofreading jobs from home. Tips for freelance proofreaders – see video above.